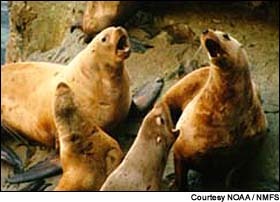 Fish and wildlife officials in Oregon, Washington and Idaho have submitted a request for new authorization to kill California sea lions at Bonneville Dam. Notification about the receipt of the request was issued today by NOAA Fisheries. The federal agency had withdrawn authorization on July 26 for lethal removal of chronic problem sea lions that annually feast on spring Chinook salmon and steelhead below the mouth of the fish ladder at the dam. State officials have asked for the new authorization under Sec. 120 of the Marine Mammal Protection Act. NOAA said it will review the request to determine whether it has sufficient evidence to warrant establishing a task force. For a timeline about the issue, click here.